get the thing done and let them howl! Harper’s agenda is disastrous for this country and for my generation. …We have to stop him from wasting billions on fighter jets, military bases, and corporate tax cuts while cutting social programs and destroying the climate. Most people in this country know what we need are green jobs, better medicare, and a healthy environment for future generations. Contrary to Harper’s rhetoric, Conservative values are not in fact Canadian values. How could they be when 3 out of 4 eligible voters didn’t even give their support to the Conservatives? 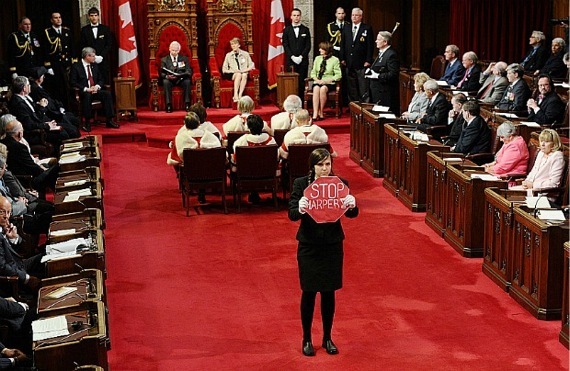 But we will only be able to stop Harper’s agenda if people of all ages and from all walks of life engage in creative actions and civil disobedience. …This country needs a Canadian version of an Arab Spring, a flowering of popular movements that demonstrate that real power to change things lies not with Harper but in the hands of the people, when we act together in our streets, neighbourhoods and workplaces. This site and blog are based in Edmonton, Alberta, Canada, where the economy pivots on oil. I encourage contributors to reflect on the oil economy. How does it impact your everyday life? How do you think through sustainability in an oil economy? This category “oil” slides into issues around the environment. But to write “oil” is to think about how we live and work. Who profits? How is our economy tied to it whether we live and work in Fort McMurray’s Tar Sands or bicycle to work in Vancouver. Oil is what we take for granted. How does oil impact our lives? How we are implicated in it? How do our workplaces benefit from it? The oil industry contributes millions to the workplace that puts a roof over my head. How do we write ourselves in the oil economy. What is accomplished when bring this network of connections into the light?